Tropical rainforest, view from the new highway between Dolosie and Pointe-Noire in Congo-Brazzaville. A virtual guide to the Republic of the Congo, also known as the Congo Republic, Congo-Brazzaville or just Congo. The country was until independence in 1960 part of the French colony of Equatorial Africa. The country is located in the central-western part of sub-Saharan Africa along the Equator, it has a short (170 km) coastline at the South Atlantic Ocean. Congo is bordered by Angola (the enclave of Cabinda), Cameroon, Central African Republic, Democratic Republic of the Congo(Kinshasa), and Gabon. With an area of 342,000 km² the country is lightly smaller than Germany, or slightly smaller than the US state of Montana. 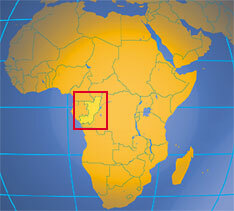 Congo-Brazzaville has a population of about 4 million people. Capital and largest city is Brazzaville, the city is located on the Congo River, in the south of the country, across Kinshasa, capital of the Democratic Republic of the Congo. Other Cities: Pointe-Noire (450 000), Dolisie (150 000), Djambala, Ewo, Impfondo, Madingou, Ouésso, Owando, Sibiti. Independence: 15 August 1960 (from France). Constitution: New constitution adopted in nationwide referendum on 20 January 2002. Location: Astride the Equator in west-central Africa, west of the Congo and Oubangui (Ubangi) rivers. Terrain: North-East: two thirds of the country are covered by equatorial forest, savanna in the south, coastal plains, fertile valleys, forested flood plains. Climate: Tropical. (climate is equatorial with two reversed seasons--half of the country lies above, half below the Equator). Ethnic groups: 15 principal Bantu groups: BaCongo, Vili, BaTeke, M'Bochi, and Sangha; more than 70 subgroups. A small population of Pygmies (less than 100 000), ethnically unrelated to the Bantu majority. Religions: Traditional beliefs 50%, Christianity 45%, Muslim 2%. 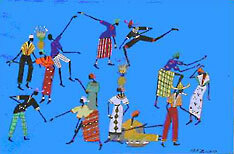 Languages: French (official), Lingala and Munukutuba (national), Kikongo, Sangho, Lari, Vili. Natural resources: Oil, wood, potash, zinc, uranium, copper, phosphate, natural gas, hydropower. Agriculture products: Cassava (tapioca), sugar, rice, corn, peanuts, vegetables, coffee, cocoa; forest products. Industries: Petroleum extraction, cement, lumber, brewing, sugar, palm oil, soap, flour, cigarettes. The Republic of Congo has had a multiparty political system since the early 1990's. Congo's Permanent Mission to the UN. Embassy of the Republic of Congo in the US. Embassy of France, Brazzaville with consular information (in French). Political map of Republic of the Congo. Map showing the administrative divisions of the Republic of the Congo. Searchable map and satellite view of Republic of the Congo. Searchable map and satellite view of the country's capital city. People live along and on the Congo river. Congo Brazzaville news (in French). Kinshasa based radio sttion with recent Congo news (in French). Site about Pierre Savorgnan de Brazza the founder of Brazzaville. Congo portal site with country information (in French). 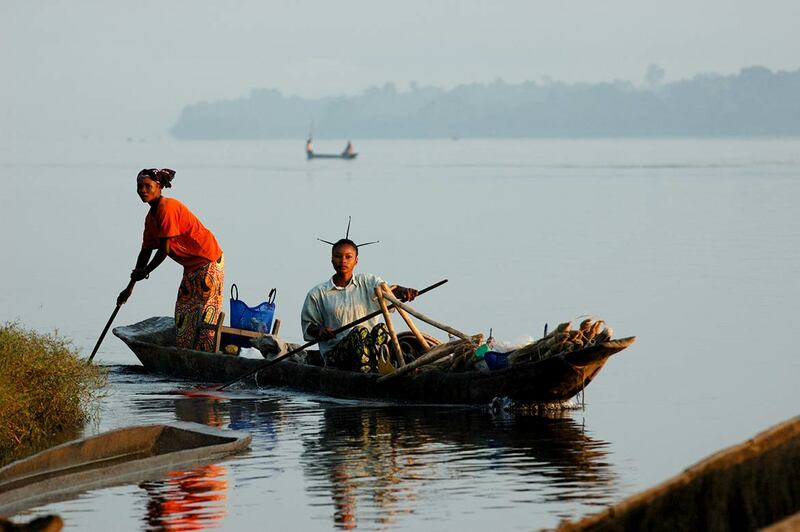 Afrique Congo le Voyage en Photos - images of a journey through South-Congo (in French). Information about the advanced technical college, Pointe-Noire (in French). INHR article about higher education in Congo. BCTF is dedicated to the conservation of wildlife populations threatened by commercial hunting of wildlife for sale as meat. CARPE is a long-term initiative by USAID to address the issues of deforestation and biodiversity loss in the Congo Basin forest zone. Site about the work of the Wildlife Conservation Society in Congo. History of the Republic of the Congo by Wikipedia.